A leading conceptual artist, Laurent Grasso (b. France) has consistently engaged epistemology and addressed, in particular, one’s perception of time. In many instances, his works originate from research into historical or scientific documents, subsequently evolving into portrayals of mystical events, legends, supernatural phenomena and other captivating subject matter. Across a variety of mediums, from painting to video, Grasso probes our notions of temporality, suggesting that what we visually retain is intrinsically tied to our personal consciousness. A mix of the past, present and future, moving back and forth between reality and fiction, Grasso has been widely acclaimed for his works that serve as an apparatus for viewing the world through different lenses, unveiling new histories in bold and elaborate pictures. 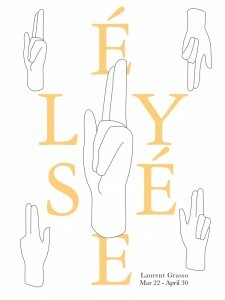 ‘Élysée’ proposes a literal as well as figurative reflection on the aesthetics of power. Melding multiple temporalities and geographical remits, Grasso creates a mode of diffraction and echo, leading to an exchange regards the different emanations of power. The exhibition unfolds around the artist’s new film shot in the Golden Salon of the Elysée Palace, the personal office of the President of the French Republic. Building a discourse between the film and selected works throughout the gallery, Grasso addresses the continuity of power, chiefly how it exists above and beyond its incarnation by an individual. 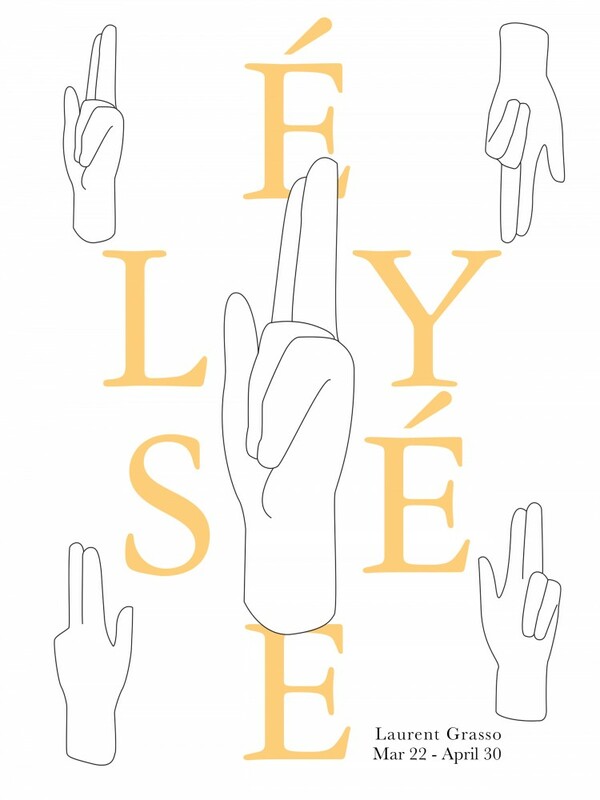 An unraveling of what we associate with, or understand by, power is explored throughout ‘Élysée’ by an array of thematically linked works. For example, a series of mysterious hybrid sculptures, from the Jomon civilisation to Christianity, allude to the objectified incarnation of power over multiple territories as well as times passed. Furthermore ‘gold’, as a hue and symbol, echoes throughout the exhibition space: from a golden ‘Anechoic Wall’ to new ‘Studies into the Past’ pieces, all of which equally allude to the gilding present throughout the Golden Salon of the Elysée. Furthermore, the aesthetics of Regalia, its attributes symbolising power, find themselves retranscribed in the hieratic white marble work of a ‘hand of justice’. Ultimately, the exhibited works compose the multiple facets of a singular paradoxical object – power – at once opaque and dazzling. Laurent Grasso has held residencies at the Villa Medicis, Rome and ISCP, New York. In 2016 he unveiled the permanent public installation ‘SolarWind’ in the 13th district in Paris and in 2008 was awarded the prestigious Marcel Duchamp prize. Grasso has upcoming exhibitions at MASS MoCA, USA and Pompidou-Metz, France. Furthermore, he was recently the focus of a major solo exhibition ‘Uraniborg’ at the Jeu de Paume, Paris, which travelled to the Museum of Contemporary Art, Montreal and was the subject of solo shows at the Kunsthaus Baselland, Basel and Bass Museum, Miami. Grasso’s work has been featured in multiple publications, including ‘Architecture Now!’ (Taschen) and ‘Soleil Double’ (Dilecta/Galerie Perrotin). Moreover, his work is held in collections around the world, including the Centre Pompidou, Paris, Mori Art Museum, Tokyo and Leeum, Samsung Museum, Seoul.